FC Cincinnati have confirmed a major change in their architectural partner, shifting from Meis Architects to Populous despite construction of the stadium actually ongoing. Such late changes aren't exactly common but FC Cincy were apparently compelled by ideas and solutions delivered by Populous in other MLS stadiums. Officially under construction from December of 2018 until early 2021, the West End stadium might not see major architectural changes, but some may be expected. 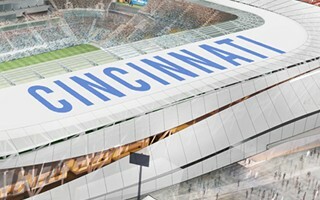 The $250-million stadium should hold 26,000 people when delivered. Interestingly, this late architect change reinforces Populous as the most prominent office for MLS venues. Until 2019 they have already stood behind 8 out of 24 stadiums, now landing their 9th contract. Recently there's one Populous-designed stadium opening every season. This year it's Allianz Field in Minnesota, last year it was Audi Field in D.C. and in 2017 – Orlando City Stadium in Florida.